Compact simplicity is the hallmark of this new Xerox multi-function printer, starting with a set-up and installation procedure that really couldn't be any quicker or easier. The full-colour flatbed scanner makes a good job of scanning photos, with a reasonably high optical resolution of 600x2,400dpi, which you can take up to 4,800dpi if you're willing to bring software interpolation into play. Scanning is backed up by useful and fully featured Nuance PaperPort SE 10 software, bundled with the printer. While scanning is full-colour, photocopying and printing are merely mono, but this does have advantages. Along with the small footprint and light weight, the 3119 is very quiet in operation, especially without any need for clunky colour toner cartridge carousels. The cartridge itself is good for around 3,000 prints and costs around £75, which works out to 2.5p per print - not exactly a bargain for mono laser printing, but at least the toner cartridge comes complete with imaging drum, so there are no other nasty running costs. The Xerox is quick for both prints and copies, with a turnaround of about 18ppm in our tests. Even more impressively, first-page print times and single page photocopies alike were delivered in 10 seconds, at least if the printer was warmed up. On the downside, even after a few minutes sitting idle, the 3119 definitely lacked the 'instant-on' capabilities of many of its rivals, taking around 35 seconds to warm up the fuser section and copy a single page. Using the front panel buttons and straightforward mono LCD panel, it's easy to choose zoom options and quantities for copies. Another plus point is that, while the output tray only has a fairly standard 50-sheet capacity, the input tray is rather more generous for such a small printer, taking up to 250 sheets. Better still, and unlike many compact laser printers, the main input tray fits firmly under the printer rather than jutting out across your desktop, and there's also a second 'by-pass' input tray for envelopes and specialist or letterhead papers. Finally, the print quality is excellent, with razor-sharp font edges and good greyscaling for mono printing or copying of colour originals. 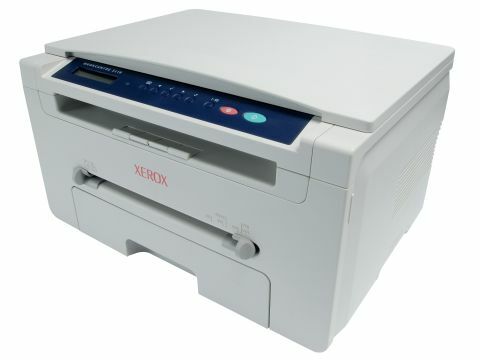 The Xerox 3119 is a well-implemented, compact mono copying and printing solution, and offers great value at the price.